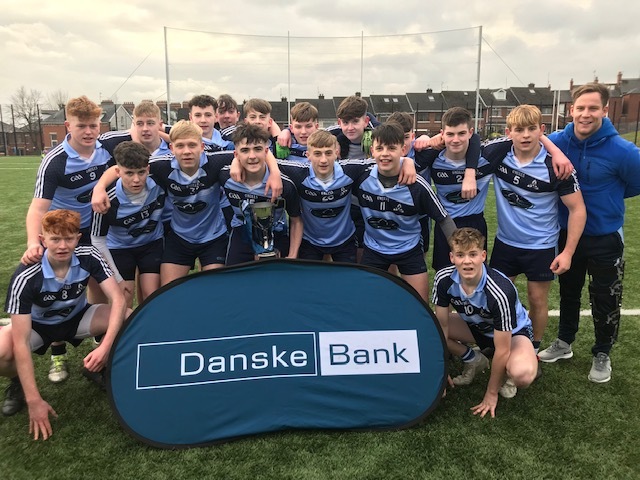 St Benedict’s, Randalstown 5-10 De La Salle Downpatrick 3-8 ALTHOUGH St Benedict’s Randalstown led this Danske Bank Corn Cúchulainn final yesterday in Coláiste Feirste by 2-5 to 0-5 at the break, it was the direct switch of centre-half back Sean McAlister and free-taker Aidan McErlain that helped them nail the vital scores to keep well in front of a strong comeback from De La Salle Downpatrick. McAlister had scored the second Randalstown goal just coming into the break but his switch to full-forward for the second half didn’t pay off immediately and a goal from De La Salle captain Cillian Burns had narrowed the gap between the sides to 2-6 to 1-7 with 16 minutes remaining. That was when McAlister stepped on the gas. Helped by the long direct ball in, he picked up possession time and again and fired home goals in the 45th and 48th minutes to push his side into a comfortable 4-8 to 1-7 lead. Lee Murphy responded with a Downpatrick goal, but McAlister wasn’t finished and he crashed home a fourth goal to bring his personal tally to 4-2 and St Benedict’s up to 5-8, too far ahead to be troubled by a late Cillian Burns’ consolation goal for De La Salle. Overall this was a good game of football with both McAlister and Burns the key men for their respective teams, but there were other strong performances from Aidan McErlain and Odhran Molloy for St Benedict’s and James Crangle, Harry O’Bank and sweeper James McConkey in the De La Salle colours. St Benedict’s : R Gribbon, C Devine, C Logan, T McKinney, S Hinfey, S McAlister (4-2), C Donnelly, O Molloy (1-0), T Murray (0-2 frees), R McVeigh, C Hastings, C O’Kane, C McLarnon, A McErlain (0-6, 0-3 frees), C O’Loan capt.